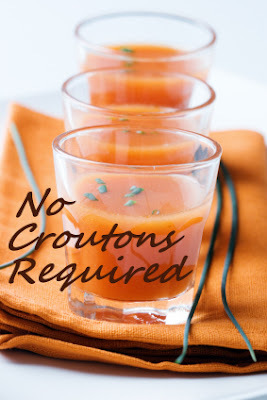 Myself and Lisa from Lisa's Kitchen will be hosting the No Croutons Required blog event, which is a new monthly soup and salad challenge. Lisa is hosting the first challenge, and the theme is vegetarian soup . The winner will receive a gorgeous badge for their blog, designed by yours truly, don't laugh, it is actually rather nice! I hope you will join in the challenge! Check out the rules on Lisa's blog and give it a go. If you have any questions you may leave a comment or email us at nocroutonsrequired@googlemail.com. I have seen this event on lisa's blog and I think it is a great idea! But when you said you would design the badge it made me wonder did you design your banner too? I have always liked it! Perfect event, especially for the long winter ahead. I love it and...being a carnivore who normally "meats" up my vegetarian recipes...it will give me a reason to be good. Hi Johanna, I am glad you visit Lisa's blog, she has a wonderful site! I did design my banner, but I have to admit that I bought the image. Which is quite a lazy thing because I did graduate from art college! Glad you like it though! I am glad you are inspired Ruth! You may meat up your veggie dishes, but your pasta dishes always look scrumptious! I have seen you commenting on Peter's blog. Shall check on Lisa's blog as well and try to post a vegetarian soup. Hi Ivy, Thanks for visiting! Thanks for letting me know about this! I'll have to think of a soup to contribute. I love finding a food blog from Scotland. My great-grandfather came over from Scotland and I've always wanted to visit there. Looking forward to participating in "No Croutons Required". Thank you Holler for organizing this roundup. Hi Tracy, Thanks for visiting! Good to know you have Scottish roots, good pedigree, girl! Hi Lisarene, Nice to meet you and I am very glad that you are going to take up the challenge! Thanks for the invite, Holler. I'm game. And ... fyi ... I'm doing better than I had expected with my New Year's Resolutions! fun! and i'm always up for making a vegetarian soup! Hey there, I found your blog via "Nourish Me". I always enjoy finding new vego blogs! I've always liked the idea of blog-hosted cooking events, but a vegetarian one is even better! I just found your blog via your comment on my blog. I'll look into this contest on Lisa's blog...thanks! Hey there Jen, I am looking forward to seeing what you choose to make! Cool, Katy! this is going to be so great! We are going to squish the winter blues with all the lovely fresh flavours! Thanks Dirty Flamingo, your Organic Rye Bread would be lovely with all our soups! Thanks for visiting megan! I do hope you join in! This is a FANTABULOUS event Holler! I am anxious to see them all to Jen! There are a lot of really good recipes so far!